Universal music will be releasing a limited edition Elton John box set, Classic Album Selection (1970-73), on July 9th comprising five classic Elton John albums recorded between 1970 and 1973. The Box set contains five albums - "Elton John", "Tumbleweed connection", "Madman across the water", "Honky chateau", and "Don't shoot me I'm only the piano player". These albums provided some of Eltons earliest hits and include some of his most popular songs of all time. With these albums Elton John became a massive success, particularly in the USA where he became the first artist since The Beatles to have four albums simultaneously in the Top Twenty. "Elton John" was Elton’s second album, released in 1970 and contains the classic hit "Your Song" which became Elton John’s first UK hit, reaching No. 7 in the charts. The album sold well in the US, reaching number 4 in the album charts. "Tumbleweed Connection" has an American Old West theme with songs such as "Country Comfort" and "Ballad of a Well-Known Gun", and there's also more of a country feel to some of the songs. The album featured Dusty Springfield on some backing vocals. Elton's next album, also released in 1972, "Honky Chateau", (the title referred to the French recording studios in Chateau Herouville) was another success and included two big hits - Honky Cat, and Rocket Man. "Don’t Shoot Me I’m Only The Piano Player" was released in early 1973 (which shows an incredible rate of work - these days a band typically releases an album every 18-24 months yet in this period Elton John was releasing them every 6 months or so). The album included "Daniel" and "Crocodile rock" - both big hits and both very different to each other. What is particularly impressive listening to this collection is the sheer quantity of top quality songs. There's a huge amount of diversity here in the music yet there is a consistently high level of quality. There are some of his best known hit singles on these albums but the rest of the material is also well worth listening to - it's all good. If you haven't got these early albums by Elton John then I strongly recommend buying this collection - you get five excellent albums, and at the ridiculously low price of only £15 (Amazon etc) then you really can't complain at the price - that's five classic albums for the price of one new album. 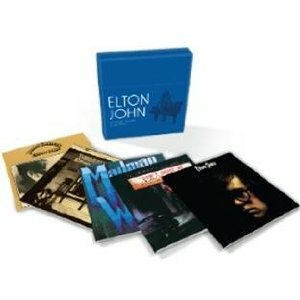 The Elton John Classic album selection (1970-1973) Box set will be released on 9th July 2012 via Universal music.